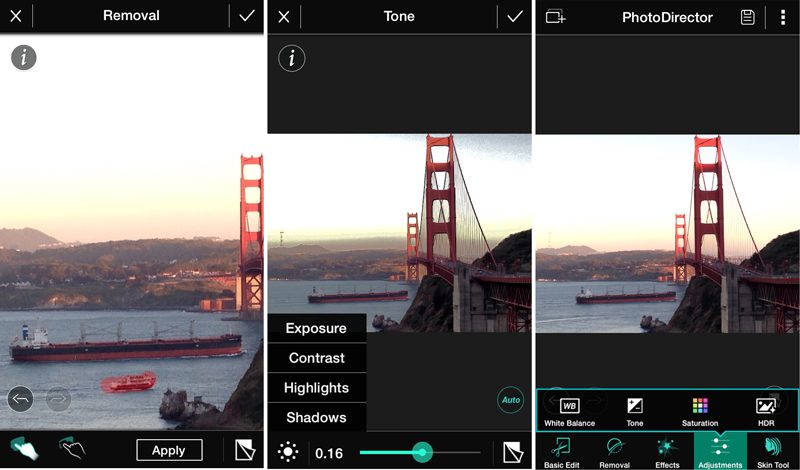 CyberLink has launched the mobile version of its PhotoDirector photo editing app for iOS. The app joins its Android sibling, which has also been updated. PhotoDirector, whose desktop app for Mac and Windows was recently updated, competes with any number of easy-to-use photo editing and adjustment tools such as Aviary and Photoshop Express. It lets you add special effects and filters, improve and enhance shots and create photo collages on the iPhone. PhotoDirector is designed for quick social sharing on Facebook, Flickr and other networks. The app’s content aware remove tool lets you eliminate anyone or anything that doesn’t belong in the frame. You can also adjust saturation, enhance tone, apply photo effects or add a vivid HDR effect. The app also features photo editing and adjustment tools such as white balance, highlights, shadows, exposure and contrast sliders, saturation and crop and rotate features. Over 50 effects, including Lomo, HDR and Vignette are available to add drama to your scene. CyberLink is also famous for its facial enhancement tools, such as YouCam Makeup and YouCam Perfect, and PhotoDirector contains just the Skin Smoothing tool, but no other facial enhancements. While PhotoDirector for iOS is free, an in-app purchase of $4.99 is also available to upgrade to a premium version. This offers unlimited object removal, 2560 x 2560-pixel resolution and an ad-free interface. The Android version of PhotoDirector is getting some love with a new version 2.2 upgrade. It lets you apply RGB curves to transform tone and contrast across individual color channels and correct lighting problems. In addition, some 20 new graphic overlays, including Grunge, Scratch and Light Leak are included. PhotoDirector for iOS is optimized for the iPhone 5 and runs on iOS 6 or later.